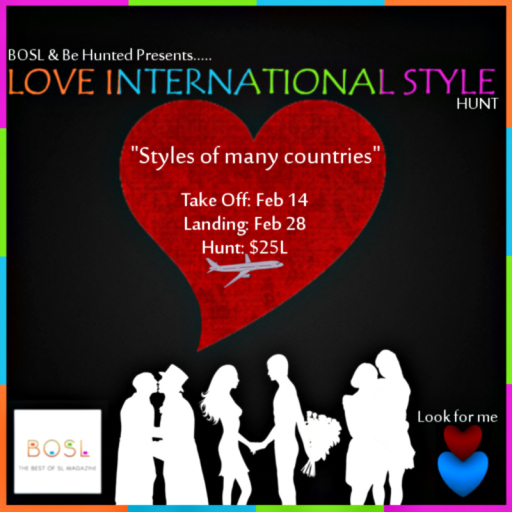 The BOSL Love International Style Hunt begins on Saturday February 14 and runs through February 28. My goal is to blog all of the outfits I received in the first few days of the contest to give you all plenty of time to decide which items you wish to find and purchase. Each item will cost $25 Lindens and will be identified in the store (slurls in post) by a box with Red and Blue Heart on it as pictured in the following advertising poster. I have never seen such a group of wonderful items – am feeling very lucky to be able to blog these items as I receive them free!!! I have to admit I have been sneaking a few into my daily wardrobe all ready!! You don’t want to miss this Hunt – take time and plan your strategy and enjoy the BOSL Love International Style Hunt this month!! !